From dramatic cliffside beaches to foggy green hillsides, California’s spectacular coastline is at the literal edge of what makes the state beautiful, wild, and great. It is also home to some of the most innovative farms in the country, where growers are breaking new ground on environmental sustainability, social justice, animal welfare, crop and product diversity, and deliciousness. 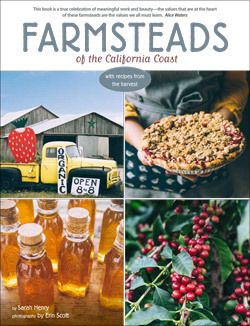 In the new book Farmsteads of the California Coast, writer Sarah Henry and photographer Erin Scott introduce a dozen of these unique and inspiring agricultural leaders through stories, photos, and recipes, with chapters dedicated to Ferry Plaza Farmers Market favorites like Apple Farm, Hog Island Oyster Company, and Point Reyes Farmstead Cheese Company. In the following excerpt, Sarah and Erin take us to Swanton Berry Farm, a pioneer in organic berry farming and farmworker rights. Pick up strawberries and jams at Swanton’s Ferry Plaza stand tomorrow, then head over to Omnivore Books at 3:00 pm to buy a copy of the book and meet the authors. The farm continues to innovate on the berry-farming front: Swanton’s is now part of a research trial of farms experimenting with growing starter strawberry plants free from toxic, fumigant-treated soil. A little known fact: California—one of the world’s largest strawberry-growing regions—has only one commercial-scale organic strawberry plant nursery source. Out of business for a few years, it is expected to be up and running again in 2016, according to Cochran. It’s not enough for Cochran to grow some of the sweetest, juiciest Chandler strawberries on the Central Coast, and make progress on the growing end. A product of a cooperative-friendly bygone era (Cochran worked for a conventional strawberry production co-op in the 1970s), he wants to do the right thing by his employees, too. In 1998, Swanton became the first strawberry farm in the United States to sign a contract with the United Farm Workers. Cochran and fellow co-owners are labor union supporters: they pay workers a fair wage and offer paid vacation, health insurance, and other benefits. In 2006, the farm went further and began offering an employee stock-ownership plan, likely the first such program in U.S. agriculture production. “Just as organic certification formalizes our commitment to growing practices that are good for the environment, our union contract and stock ownership plan formalize our commitment to the human side of the farming equation,” says Cochran. Swanton Berry Farm employs around 25 full-time and another 10 or so part-time seasonal workers. The leader-of-the-pack status doesn’t end there. In 2014, Swanton was acknowledged by the Agricultural Justice Project as a farm demonstrating high social-justice standards. The Food Justice Certified label, awarded by a nonprofit coalition concerned with domestic fair-trade matters, has so far been granted to only a handful of the nation’s farms. For Cochran, growing wholesome produce and nurturing farmworker dignity go hand-in-hand in the quest for an equitable food system for everyone. All this is behind-the-scenes stuff: many strawberry lovers simply know the farm as a great place to harvest their own berries, pick up a punnet or two or three of overflowing, aromatic ruby red orbs, or grab a couple of jars of their luscious preserves. Strawberry-olallieberry, blackberry, tayberry, loganberry, or strawberry-rhubarb jam sound good? The farmstead setting couldn’t be more charming: Swanton leases 80 acres of coveted California coastline, at Coastways in Pescadero. The farmstand sits on 50 acres permanently preserved thanks to the Trust for Public Land. Cochran has never had to worry that a developer was going to pave paradise and put up a parking lot. Cochran grew up in Southern California in Carlsbad, which then featured pockets of farm country. He attended college in the 1960s at the University of California, Santa Cruz, where he became interested in unconventional farming practices. Nevertheless, he began his commercial farming career growing strawberries using conventional methods. After first-hand exposure to the harmful health impact of poisonous pesticides, however, he vowed to find a different way to farm. Strawberries are a fragile, finicky fruit. Cochran’s primary tools for pest management and soil health: crop diversity and soil building. The farmers spend several years building up the soil with compost before planting strawberries. They also rotate field crops, such as subbing in broccoli or cauliflower, to help control disease and pests. Once a lone voice in the organic strawberry business, Cochran’s farm has influenced many California farmers who now grow organic berries, Swanton style. Seeing his success, even some of the biggest berry producers in the country have followed suit. Since the 1960s, conventional California strawberries have been grown with the aid of a highly toxic soil fumigant called methyl bromide. The chemical, banned for years in most of the developed world, is slated to be fully phased out of the United States by the end of 2016, ending a decades-long chemical dependcy farmers. Unlike large agribusiness crops such as soy, grain, or dairy, the profit margins for a small-scale strawberry farmer are pretty thin. And there are no government subsidies to sweeten the deal. Moreover, strawberries are tricky plants, prone to fungus, pests, and weeds. Strawberry farming is not a way of life for the risk averse. But Cochran and company at Swanton are resilient, persistent souls. Swanton’s is no overnight success story. Begun with a partner and just four acres of land in the Swanton Valley, the early, conventional-method years were difficult. The first few years as an organic outfit were even tougher. Yields were low; trial and error proved the order of the day. Cochran held a second job for the first six years or so, just to keep food on the table, but his growing gamble eventually paid off: production methods worked, yields improved, flavor and form began to shine, and Whole Foods came calling. While demand is up, in the past couple of years yields have been way down. “The culprit is weird weather. Climate change has been bad for business.” says Cochran, “No rain and not enough chilling in the winter are the biggest factors.” Unseasonably warm winters affect the vigor of the plant. Strawberries thrive with winter chilling. Without it, the plants aren’t as robust or big come spring, and supply suffers. Still, the farm continues. If Swanton’s bustling business at farmers markets—nine stalls around the Bay Area—and busy farmstand traffic are any indication, it is possible to grow luscious fruit, protect the earth, treat workers well, and run a modestly profitable farm at the same time. Excerpted with permission from Farmsteads of the California Coast, by Sarah Henry and photographs by Erin Scott (Yellow Pear Press, 2016). Visit Swanton Berry Farm at the Ferry Plaza Farmers Market on Saturdays.